Alcatraz island tourists. 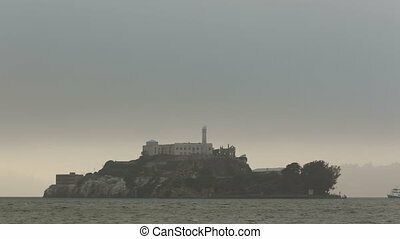 Tourists gather on a pier to view the world famous prison on alcatraz island in san francisco, california. 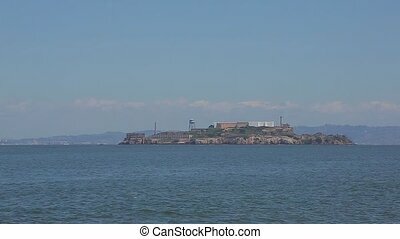 Tourists gather on a pier to view the world famous prison on Alcatraz Island in San Francisco, California. 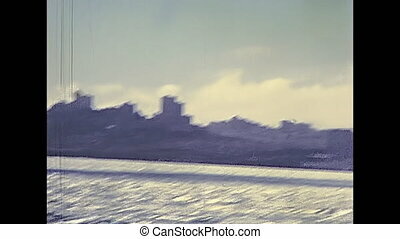 Alcatraz island in San Francisco Bay skyline. Sea view from boat touristic tour. Archival San Francisco restored footage in California, United States in 1980. 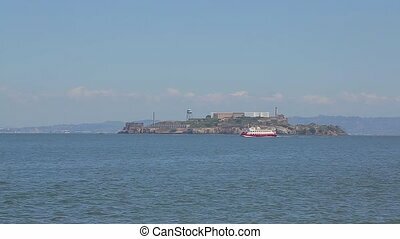 Panoramic boat sea view of Alcatraz island, warden's house and lighthouse of the prison. Bay of San Francisco, United States. Traveling in California. Popular tourist attraction in San Francisco. 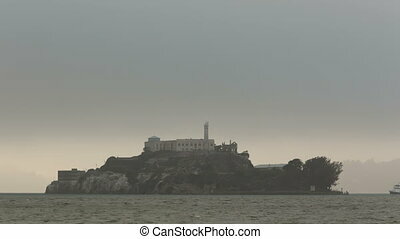 Alcatraz island, San Francisco, California. 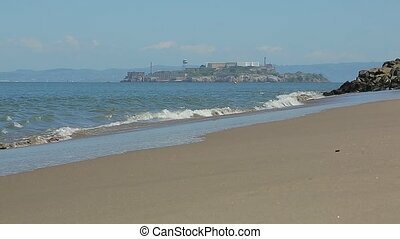 Sandy beach in the foreground Alcatraz prison. 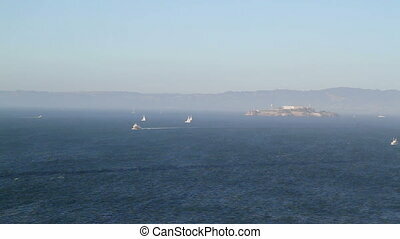 Alcatraz Island is one of the most famous tourist attractions of San Francisco. 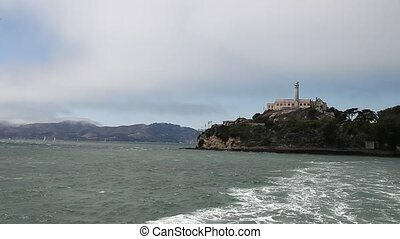 Cruise ship to Alcatraz Island in San Francisco Bay. 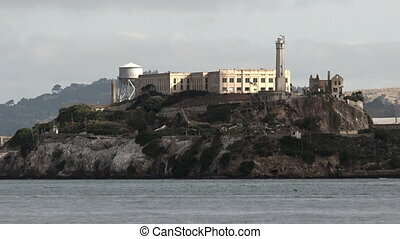 It's mostly known as the home to the most secure prison held some of the most notorious criminals in American history. Tourist boat sails near the island of Alcatraz. 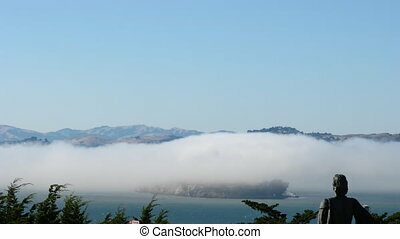 Alcatraz Island is one of the most famous tourist attractions of San Francisco. 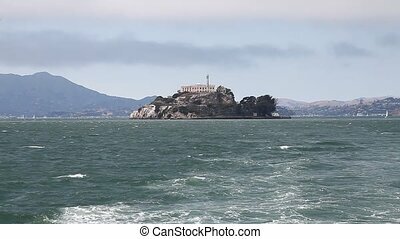 Alcatraz island prison of San Francisco. Sea view panorama by ferry. Warden's house and lighthouse. Escape and freedom concep. Traveling in California. Popular tourist attraction in San Francisco. 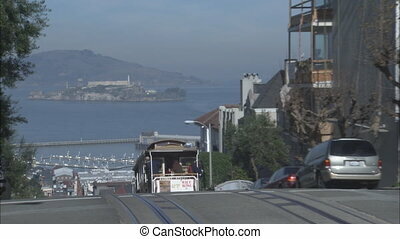 Viewpoint of Alcatraz Prison in San Francisco Bay. Alcatraz Island is one of the most famous tourist attractions of San Francisco. 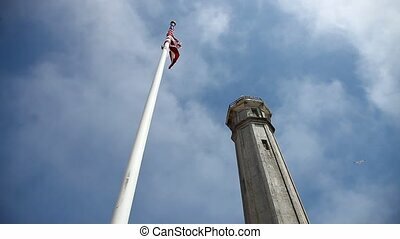 San francisco prison Alcatraz in Eagle Plaza with American flag waving and lighthouse, ground view against moving cloudy sky, a fling bird. 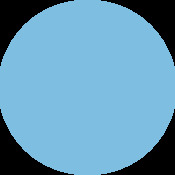 Concept of American freedom. Travel and holidays concept.